Product prices and availability are accurate as of 2019-04-09 13:02:31 EDT and are subject to change. Any price and availability information displayed on http://www.amazon.com/ at the time of purchase will apply to the purchase of this product. Nymphaea 'Trudy Slocum', White Flower Color, Tropical / Annual Night Blooming Waterlily, Height: 8-14", Width: 4-6", Depth: 4-6" Blooms from late spring to late fall, depending on the weather.The olive green pads are can grow up to 12" inches and the plant needs 3-4 ft to spread its leaves. 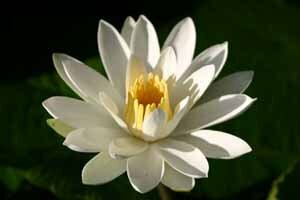 Planting instructions: Tropical waterlilies should be planted in pots at least 12" in diameter. A 3 to 5 gallon size should suffice for each lily. Fill the pot half full with a rich garden soil and add 2 to 4 fertilizer tablets, then continue to fill the pot with soil to about 2" from the top. The plant should be set upright with the roots buried gently in the soil. Make sure the growing tip of the plant is not buried. Next, add an inch or two of gravel or sand in order to prevent the soil from escaping from the container. Remember to keep the gravel away from the crown of the plant. 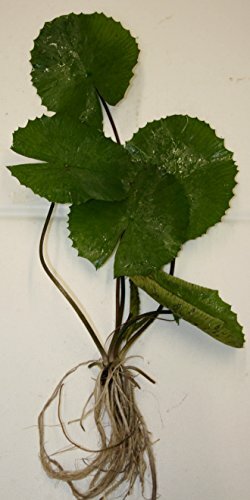 The plant can now be lowered into the water to a depth of approximately 6 inches. 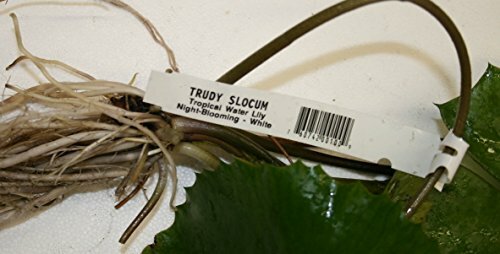 As the plant grows, it can be lowered to a depth of 12 inches.Tropical lilies cannot tolerate cold temperatures and should not be planted until the water reaches a temperature of at least 70°F. Planting too early can cause dormancy.